It seemed that everyone’s plans changed Saturday night following the stage collapse at Downsview Park that resulted in Radiohead’s drumtech dying and several others being injured. 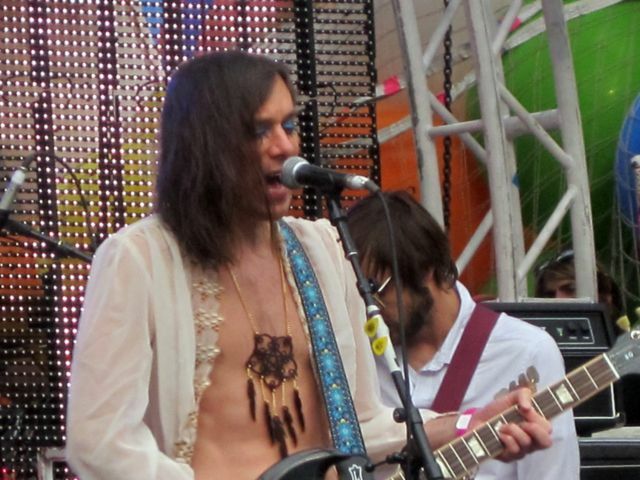 So many other options for a Saturday night were at their fingertips, most notably Luminato and the NXNE shows that started earlier in the day at Yonge-Dundas Square.I arrived and caught the end of the of Montreal set. This was when I met up with several friends as well as several thousand strangers which made it slightly uncomfortable and at times claustrophobic. As well, it didn’t help that the Flaming Lips set started a half-hour late. I’m getting old. Balloons, confetti, ten-minute drawn out versions of crowd favourites, but a nice tribute/cover of Radiohead’s”Knives Out” though. A video of this can be found here. 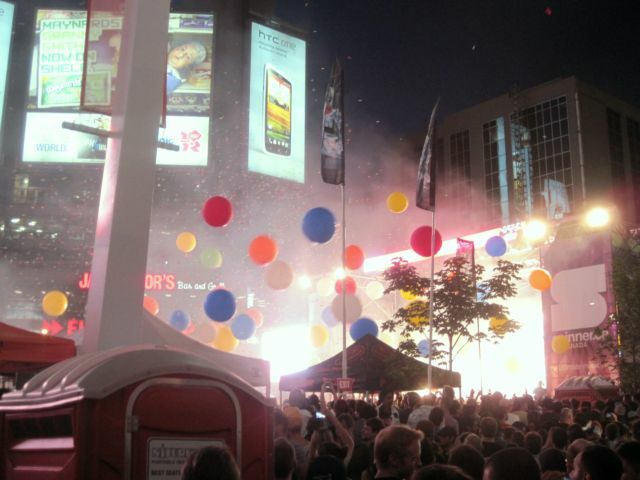 The Saturday night shows at Yonge-Dundas Square were filled with a mix of emotions because of what happened just a few hours prior. It was also filled with disorganization, cheesy MC-introductions, colourful bouncing balloons and just too many people. Most being people that had seemingly never been around other people before. Picture someone walking on the Tokyo subway on Monday morning with no shirt on and a hot pot of coffee. Round two was to get out of there and make our way down Yonge and across Queen street. This allowed us to pass what seemed like several hundreds standing around staring at an empty stage with bright lights in preparation for the MMVAs the following night. People never fail to surprise me. By the time we made it to the Rivoli two-piece Swedish outfit The Deer Tracks were just finishing up. I headed up to Kensington to catch Life in Vacuum at Detour Bar. Small, cramped and sadly no Kensington punks. Life in Vacuum (only one ‘c’) are a three-piece metal/punk band with groovey distorted bass. They’re from Waterloo and whenever I hear of bands from there I just assume they play math-rock which makes me a math-icist and I’m totally comfortable with this. Three white kids from the burbs that are passionate about their music. Loud and earplug-friendly. Great ‘stache on the bassist too. After Oberhofer’s set, I was primed for Of Montreal’s trademark wackiness. It was a typically solid performance with colourful stagewear on the band’s part, people in pig masks crowd surfing, staged wrestling matches, and a guy who was briefly dressed as the god Pan I think. Fun times. I can only imagine what the guys preaching on the corner across the street made of the shenanigans. The party’s crashing us now, indeed. Logically, the one-two punch of Of Montreal and The Flaming Lips back to back would have been a no brainer, but whoever scheduled this thing decided to slot Portugal The Man between those two made a bit of a miscalculation in my humble opinion. The Portland rockers started out promising enough, but that early promise shortly turned to “meh” as their set went on. Singer John Baldwin Gourley’s got a strong, bluesy voice, and the band was talented enough, but their set was a bit of a one note performance to me, much of it seeming a bit samey after awhile. I appreciated their cover of The Beatles’ “Helter Skelter,” but when they ended their set with the coda to “Hey Jude,” I found it to be veering on the edge of shameless crowd pandering. Two Beatles songs? Come on. While there was nothing wrong with their performance, they bored me a little bit. Then again, when sandwiched between two such colourful bands, it’s a little hard to really match that. Leave it to the Flaming Lips to take Elvis’s great comeback single and transform it into a strip down dream pop like track. One of my favorite karaoke tracks, Suspicious Minds has also been covered by musicians ranging from Glasvegas to Clay Aitkens to Dwight Yoakim. I decided to show you the Flaming Lips version because well, it’s the Flaming Lips and they are awesome. Barcelona – The first night of Primavera Sound was a mixed bag of eclectic music that featured the likes of Big Boi, Of Montreal, Grinderman, Girl Talk and Interpol. With such a wide variety of music, it was no surprise that the most eclectic of them all, The Flaming Lips would be the headliners for the evening. The Flaming Lips live show has been well documented, everyone knows about the space ball walk, the massive confetti guns, the gigantic laser hands and the throng of dancers that are placed on each side of the stage during the show. These things are now expected staples for a Flaming Lips show – everyone knows it’ll happen and everyone expects it to happen. Having said that and having seen them live not even a year ago, I still left the Interpol show early to grab myself a good spot for the Flaming Lips show at Primavera Sound. While those things are no longer a surprise to me, they are still undeniably awesome. Before the show started, rumors were swirling about what type of show that Oklahoma band would play – they were due to play their album The Soft Bulletin in July so a bunch of us had hypothesize that they would get a preview of that show. We were wrong. Regardless, their was a collective buzz in the air as Wayne Coyne took the stage before the show to announce that the show would feature heavy strobe lights and that if you were uncomfortable, you could simply look away. The show started shortly after 2 am with the now legendary space ball walk. It’s an old Lips trick that has started off every show for the better part of the decade but remains enthralling every time. To see the look on a fan’s face when they see this for the first time is absolutely priceless. The spirit of the crowd was taken even higher when the opening notes from She Don’t Use Jelly were played, setting everyone at the San Miguel stage into a sing along frenzy. Much of the show played out much like their show in Toronto last year and still, it was great. I could always sing along to an acoustic version of Yoshimi and scream out to the Yeah Yeah Yeah song. Wayne Coyne once again had the crowd in the palm of his hands. The highlight of the set was the inclusion of Race for the Prize during the encore, a song that had been left off their show last year. It was clearly a highlight for everyone at the show as well, as the crowd went mad at the opening sequence of the track and started singing along to the song well after it was over. The hour and a half set ended as expected with the always emotionally overwhelming Do You Realize, a song and performance that can warm all the cold hearts in the world with it’s sheer magnificence and power. I could see this song in concert a hundred times and still spaz out when the opening beats of the song are played with the massive lights and confetti cannons blasting. 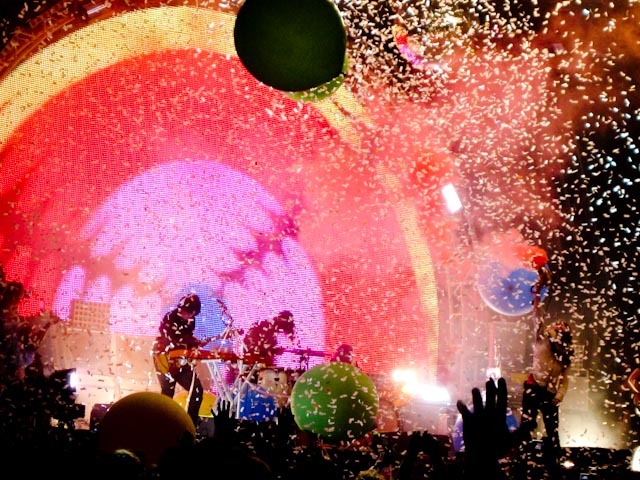 It’s truly one of the great concert moments you could ever have, which its only fitting because whether the tricks are new or old, a Flaming Lips show will always be amazing and this Primavera set was no exception.